If you're inspired to write poetry for someone special this Valentine's Day, then try making your own mini book of love poems. All you need to get started is some paper, thick card, ribbon and a few embellishments for the cover. You can then go ahead and write your poems or secret messages on each page to create a truly personal gift. As an alternative, fill your book with photos and sketches of treasured holidays or anniversaries spent with your loved one, for you both to share on 14 February. Cut a length of butcher or lining paper and accordion fold it to make a book insert. Use a bone folder or ruler to make sure the edges of the pages are crisp. Aim to make a square book insert, so each page measures for example, 3 x 3 inches (7.6cm x 7.6cm), 4x 4 inches (10.2cm x 10.2 cm) or even slightly larger, if desired. Cut two square-shaped pieces of thick card 1/2 inch (1.3cm) larger on all sides, than the dimensions of your book insert. Cover each piece of card with gift-wrap or other decorative paper; mitre all four corners and fold to the wrong side. Glue the paper to the card to secure it in place. Let dry. You now have a front and back cover for your mini book. Place the front and back covers wrong side facing upwards, with a gap of around 1/2 inch (1.3cm) between them. 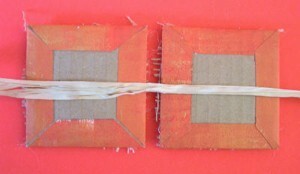 Glue a length of ribbon or raffia across the middle of each cover as shown in the photograph to make a tie for your book. Glue the first page of your paper book insert to the inside of the front card cover. Leave to dry. Then glue the last page of your book insert to the inside of the back card cover. 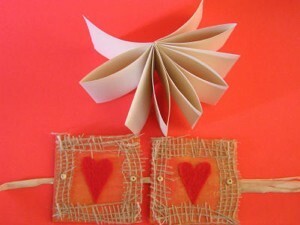 To finish, decorate the outside covers of your mini book using fabric hearts, lips, kisses etc. Anne, This project is so cute! 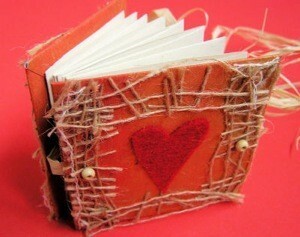 The book needn't be just for Valentine's Day. One could easily change the embellishments and use this for almost any occasion. Thank you for sharing!